We are here at Qumran, the Dead Sea and the place where John the Baptist baptized. John the Baptist ate grasshoppers here (Matthew 3:4). Did Jesus eat them? Why not? It was clean food for the Jews specifically mentioned in the Bible. Leviticus 11:22 says they are “clean” and can be eaten. I promised the group if they found one I’d eat it — never believing they’d find one. They found a BIG one. What to do? I ate it — live and wiggling — very crunchy. 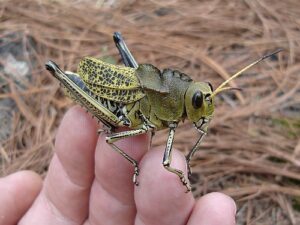 Now I know what a locust tastes like and I know why John the Baptist ate them with wild honey! Living the Bible here in the Holy Land! Videos for Friday PM and Saturday coming soon, including me eating the grasshopper!